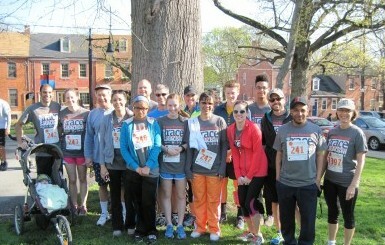 Some of the members of Team GKH pose before the 2014 Race Against Racism. Once again, GKH sponsored a large team of runners, walkers, and one stroller in the YWCA’s 16th annual Race Against Racism on April 26. Team GKH included attorneys and staff, along with numerous family members and friends. Participants ranged in age from attorney Justin Bollinger’s 6-month-old son to founding partner Mel Hess, whose age is a firm secret. GKH was also a proud Bronze sponsor of the race, which is an annual fundraiser for the racial justice initiatives of the Lancaster YWCA.